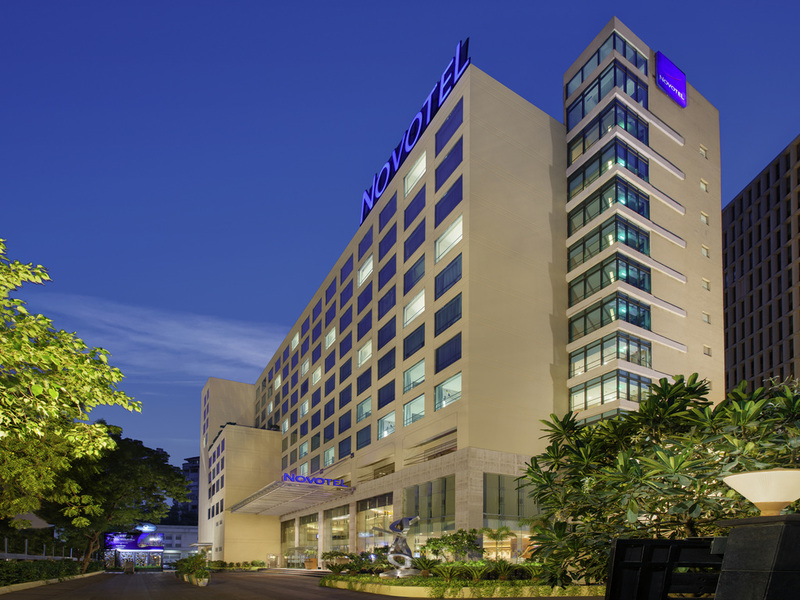 Novotel Ahmedabad is located on the SG highway with easy access to Sanand, Changodar & Mahatma Mandir. The hotel has an On-site government authorised liquor store 'The Liquor Shop', with a stellar collection of more than 300 domestic and international labels. Novotel has an award winning 24/7 restaurant 'The Square'. A fully equipped spa, gym & pool ensure you relax and keep fit. The hotel is 30 minutes from the airport, ideal for business and leisure guests with 184 conteporary style rooms and suites. Located on the Sarkhej-Gandhinagar Highway, close to the commercial hub and shopping centre. Fitness Centre, Spa, Salon and 24/7 restaurant offering international cuisine. Hotel has a liquor shop open Monday to Saturday 12:00-19:30, except government holidays. Starting from 300 sq.ft., each contemporary guest room and suite features floor-to-ceiling windows, workstation, LED TV, electronic safe and sofa. Suite rooms offers modern amenities like Airport transfer, whirlpool bath and kitchenette. Open 24/7, The Square boasts of the longest breakfast from 4.30 AM to noon where one can see & feel the aromas of the buffet, live cooking and an impressive a la carte menu. An ideal place for Sunday brunches featuring lavish buffet & live music. If i have to ask for everything and wait for hours before it comes / delivered in the room, its as good as a lodge. Day 1, asked for smoking room, it took 30 mins, still not ready, frontline manager told it will be ready and my luggage will also be shifted by the time i come from office... nothing was done, late night came from office and shifted my luggage to smoking room... then when asked for a match box - took almost 30 mins to deliver. Day - 3 or 4, asked for dental kit in night, it never came.... Have to ask for shaving kits, dental kit etc every time.... are we not paying for stay and all these things? Day before last day, asked one of the waiters in restaurant during breakfast to get Chole poori, guy did appeared and never delivered.... If i compare this Novetel with Pune (no comparison), Pune is far far far better then this hotel. People, frontline managers, servers, everyone is rude, the way they talk, not sure what they are proud of, may be delivering this pathetic service they are proud of...... really frustrating and pathetic services... charging for hotel but services are like a lodge (including behaviour of frontline managers and waiters). Hopeless service and worst food quality. Found insect in morning breakfast. (Already noticed to your staff on Dt. 10/4/19) Check in process is also very hectic. Thanks. everything was as expected ,some minor issues as for example the newspaper I was receiveing every morning was in Hindi language and did not changed in englidh despite my notice to reception. Otherwise it was an Accor hotel hospitality. My stay in novotel was a one i will always remember. I would like to name some staff members for appreciation. These people are golden for the hotel it just because of them i was able to have memorable time. The restaurant manager Ashish, Tanmay, sachin, you chef Roshan, from the front desk Somil and samjhana, Security staff Asha and all the restaurant staff. I would revisit everytime just for them and the service they offer. Thank you so much. My stay has been very comfortable and satisfying. Fine details of the guests requirements are being met with a very professional and friendly approach. Overall experience has been fantastic. Keep it up team Novotel - Ahmedabad. The Check In and Check Out process is longer than required - but apart from that the service the hospitality is perfect. Novotel Standards are quite met. I have been living in the hotel for over 10 months now. The staff was good. Rooms were really small. Carpet in room and dining room furnitures had dark spots. No fruits or cookies in the room. The room size felt like some 3k fortune or an even smaller hotel. Just soap & shampoo in the room. Have to call for tooth brush, comb and shaving kit. Not provided first itself in the room. No shoe shine or robe. Just for namesake Novotel...doesn't even feel a bit like one. In room no 837 bathing system can't be proper work. When shower start then some noise can be occured in bathroom. Dear Sir, I would like to draw your kind attention that Mr. Gopal Kumar t. was arrived in your hotel on 25.03.2019 and occupied room No.1006 and departed on 30.03.2019, the bill raised by you bearing no. 50336 dated 30.03.2019 amounting to Rs.25348.76, against of which Mr. t. has paid Rs.23,000/- on 27.03.2019 through Credit Card and Rs.25,348.76 on 30.03.2019 through Credit Card. he has paid total Rs.48,348.76, whereas yours bill is Rs.25348.76. Copy of the Bill and payment receipt is already mail to H8… for reference. You are requested to check and refund the balance amount of Rs.23,000/- to the Credit Card Account. With Sincere Regards GOPAL t.
Pool is disappointment. Room interiors are outdated. No grooming kits, slippers provided Floor carpets are full of dust in lobby, restaurants, rooms. Room bathrooms have rusted fittings. Cable quality is very poor. Good food ,rooms were comfortable and service was excellent. In short, everything was exemplary. VERY WARM TRETEMETNT THROUGH STAFF & OTHER MEMBER. THANK YOU VERY MUCH FOR YOUR GREAT SERVICE PRMOD S.. Comfortable stay. Great food. However, shower room can be better equipped with space/deck to place our shampoos, facial wash and bottles, bath salt can be provided since the room comes with bathtub. Fruits at buffet counter can be varied (not only apple, banana and orange everyday).